Autumn is my favorite season for many reasons; amongst the greatest is the change in tree and shrub foliage. I love greens all summer long, and hate to see them turn to browns and greys in the winter, but before this occurs we are treated with a spectacle of color painted by nature herself. Consider the variety of vegetation coupled with an inexhaustible array of colors that man can mimic, but never duplicate in such exquisite beauty. The words above are from a song made famous by a rock group called The Byrds in 1965. The lyrics are from the Book of Ecclesiastes in the Bible. Pete Seeger, a singer-songwriter took these words and crafted this song which became an anti-Vietnam War song. The last verse says that peace is never too late. It becomes obvious to me that these words are timeless in their meaning and interpretations according to the era they are read and pondered. We know not what is in store for any of us…only One has such knowledge. We can plan and prepare, discuss and implement, but we never really control most of the outcomes of our lives. Some will disagree, of course, and that’s okay. Each of us views life from different lenses. My perspective comes from several sources: my own experiences and seeing those of others, plus my reference point concerning all things-God. 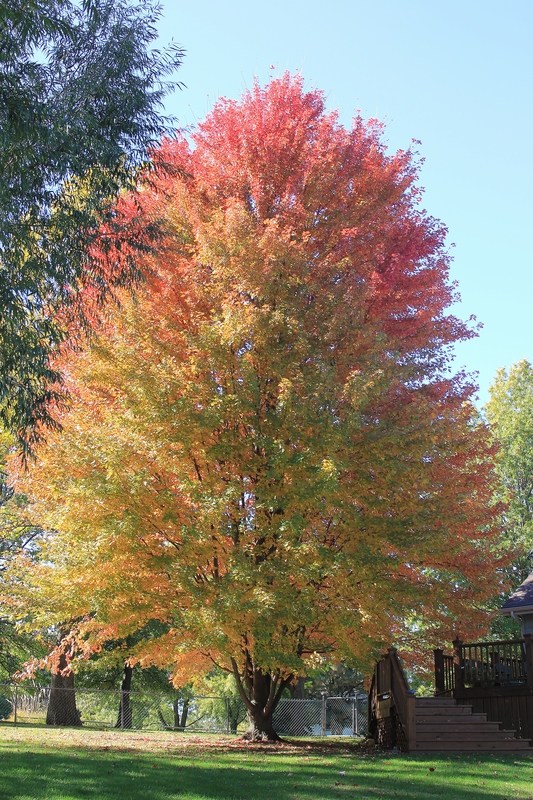 Change starts one leaf at a time, and before you know it, the whole tree is ablaze in color! May this season of your life be full of growth, peace and an abundance of blessings. 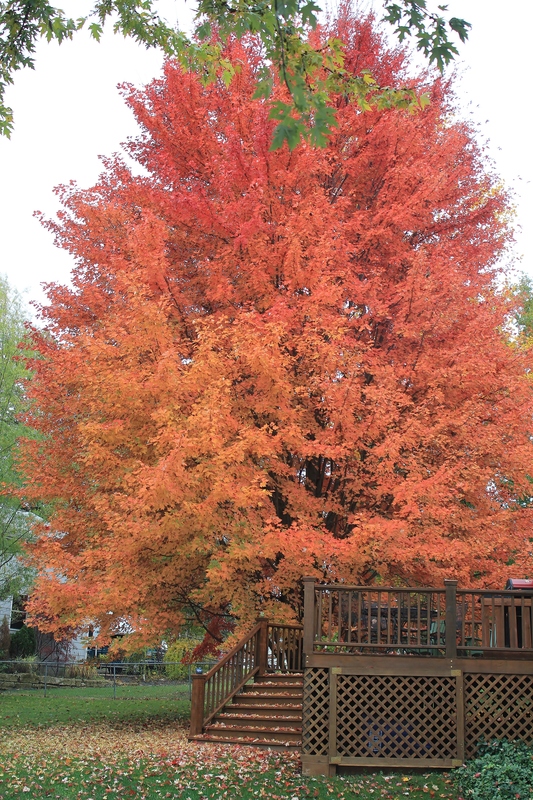 Most viewers will look at this maple tree and say to themselves, “How beautiful” or “I have one that can top that”. The point of this post is not to show off our beautiful red maple tree that we planted about twelve years ago, and, I might add, a bit too close to the deck we enlarged ! No, the point is in the leaves. When the leaves begin to turn colors, this tree is glorious to behold. I simply can’t take my eyes off of this vibrant plant as it is transformed from deep greens to brilliant reds and magnificent oranges. Even the shape of maple leaves are spectacular! The symmetrical edges, the striking veins, the subtle differences in each leave’s color are amazing. The symbol of Canada and of maple syrup, this leaf is well-known. But then something happens that ushers in different thoughts. The beauty that once hung upon branches begins to fall to the ground (and on any horizontal surface within its breadth). A carpet of foliage is laid below us, and for a short period of time the color remains. 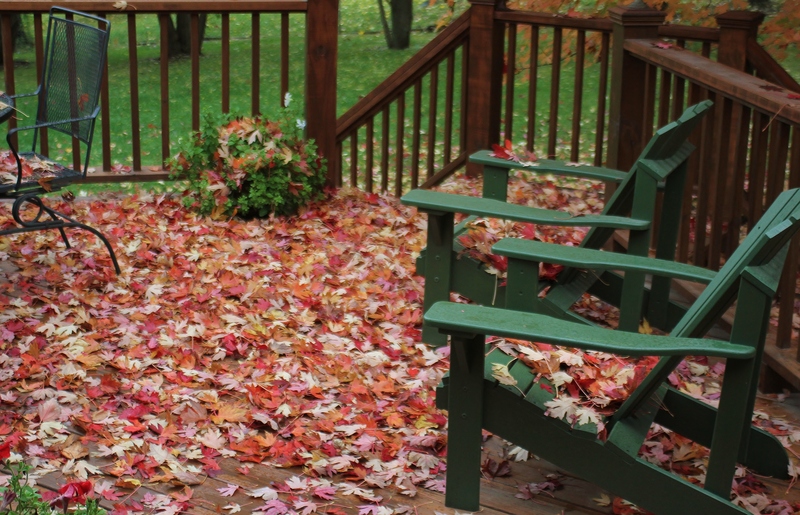 As winter approaches the leaves will fade and dry, creating not a soft carpet to walk on, but a chore to clean up. This single tree can create a pile of leaves a foot deep in a sixty foot diameter arc when it is done dropping its precious cargo. That is a lot of leaves to deal with. My question for you is simply this: How many leaves are there? Your quess is as good as mine so give it a shot and share your highly qualified estimate with me. Just for grins, I may award a prize for the most accurate number…if I knew what that was. Ha! P.S. Have a Breathtaking Autumn.